Magnolia Mamas : Thanks for Shell-abrating! Today is Cute's birthday and I can not believe that my tiny baby boy is six today! In my head I still picture that teeny tiny little blonde toddler giggling around the house, but each day I am reminded he is growing up at warp speed. We have a few fun things planned to celebrate the big day with him, but the celebrations have already been well underway. Over the weekend we hosted a small little party for him. This year we scaled the birthday celebrations way back. We just weren't up for a big party, and with Disney on the horizon for his birthday/winter break, we felt like keeping things low key would be the best way to go. We told him since he was turning six, he could pick six friends to take somewhere fun. I asked Cute what he wanted this year, and he said without a doubt he wanted Ninja Turtles Laser Party. So Ninja Turtles Laser Party it was! We scheduled a laser tag, bumper car, bowling, boy fueled afternoon, ordered some pizza, and called it a day. It was so much fun, and we absolutely loved having a more intimate group. I definitely think this is how we are going to do parties moving forward. So. Much. EASIER. Even though we kept it pretty simple, I couldn't let the day go without putting my own little something into the mix. Sticking with tradition, I decided to do at least a themed favor. I came across these super cute Ninja Turtle Travel Books, and thought they were perfect for this age group. I paired each book with a gel pen I found in Ninja Turtle themed colors, and it made for the easiest favor ever. Plus I figured parents would appreciate a busy book over a candy treat or another toy around the house. After messing with a few different TMNT sayings, I whipped up fun themed thank you note. I found some blue sparkly ribbon, grabbed my favorite handy dandy bags to wrap gifts in, and had a cute wrapped favor in just seconds. I think they turned out adorable, and when Cute handed them to his friends it seemed like they were a big hit. 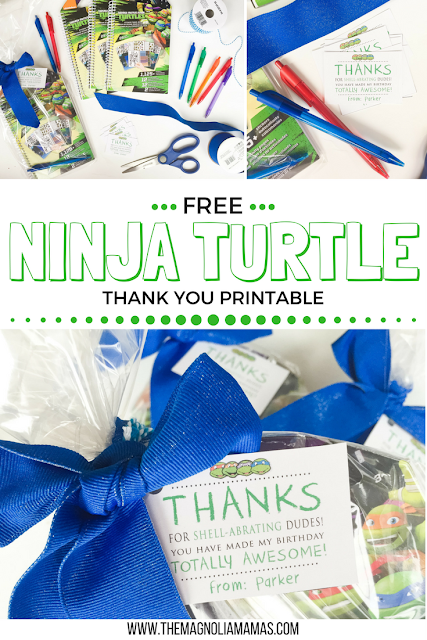 To grab an unpersonalized version of this printable for your own little Ninja Turtle loving little one you can download it HERE. Now off to shower my baby boy with hugs, kisses, and will time to stop. Or at least put the breaks on a little bit.